UPDATE AS OF 12/12/16: Thanks to the generosity of our community, our Wrapping Party on Wednesday, December 14th is currently at full capacity for volunteers, and we cannot accept any additional volunteers for the event. Thanks to the hundreds of you who have RSVP’ed to attend! Project Christmas Angel will be held on Wednesday, December 14, 2016. 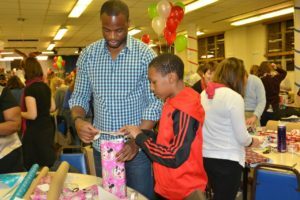 This is an event that OAR has held for over 20 years, where we provide holiday gifts to children of incarcerated parents. Last year, we provided nearly 1,200 gifts to 395 children. Parents of those incarcerated in the Arlington County Detention Facility and those recently released who are active in OAR programs or are on probation qualify for the program. The parent fills out a form to tell us about their child (name, age, gender, interests, etc.). At our Wrapping Party on December 14, 2016, volunteers will gather to select the children’s gifts from items that have been donated, wrap the gifts, and prepare them for delivery. Between December 15-21, volunteers will hand-deliver the gifts to the childrens’ homes in the metro DC area. For those children who live outside of this area, we mail the gifts to their homes. There are several ways to get involved in this event. Donations of toys and gift cards are needed. New, unwrapped toys (no clothing or stuffed animals, please) for ages newborn to 18 are accepted. Gift cards are often given to the teens, who can be hard to shop for. We also have an Amazon wish list with gift ideas for teens. Items purchased from the Amazon wish list can be shipped directly to the OAR office. Donations may also be dropped off to the OAR office during our business hours (1400 N. Uhle Street, Suite 704, Arlington, VA 22201; Monday through Friday, 8:30am-12:00pm and 1:00pm-5:00pm). Donations may also be dropped off to St. Andrew’s Episcopal Church (4000 Lorcom Lane, Arlington, VA) on Wednesday, December 14 between the hours of 10am-6pm. We also accept financial contributions to help cover to the cost of mailing the gifts to children who live outside the metro DC area. Checks should be made payable to OAR. Donations can also be made online via OAR’s website. If you donate via our website, please be sure to specify in the “Comments” section that the funds should be for Project Christmas Angel. Sponsorship opportunities are also available. Click here to learn more about becoming a sponsor for Project Christmas Angel. Thanks in advance for your interest in Project Christmas Angel! We look forward to brightening the holidays of hundreds of children this year, and strengthening the relationship between incarcerated parents and their children.